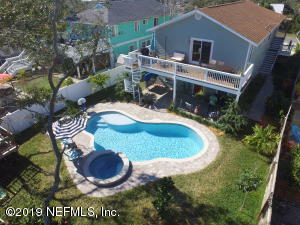 5 Bedroom, 3 Bath Pool Home in St Augustine Beach! Plenty of room for the whole family in this beautiful home within walking distance to the beach and intracoastal. Relax and enjoy the laid back lifestyle of Anastasia Island! Fully updated 2 story home with amazing pool and backyard oasis just built in 2018. Paver pool deck and patio area offers plenty of room for entertaining and relaxation. Main living area and kitchen are on the second floor with vaulted ceilings and lots of natural light. Large master suite with private balcony overlooking the pool area. There is a spiral stair giving access to the backyard. Lush tropical landscaping throughout the grounds are meticulously maintained. Oversized 2 car garage with lots of room for storage and work bench. Home is pre-wired for generator. This home has been on the market since Mar 07,2019. Courtesy of JANICE BROWN REALTY.